Sergei Rachmaninoff, the Russian piano master. When Rachmaninoff moved to the United States around the time of the Russian Revolution, he brought the spirit of his country with him. Beneath his cold, forbidding appearance lurked one of the warmer hearts in the business. (Don’t be put off by the fact that his works are almost all in a minor key or that they have such titles as Isle of the Dead.) Keep reading for more facts about Rachmaninoff. 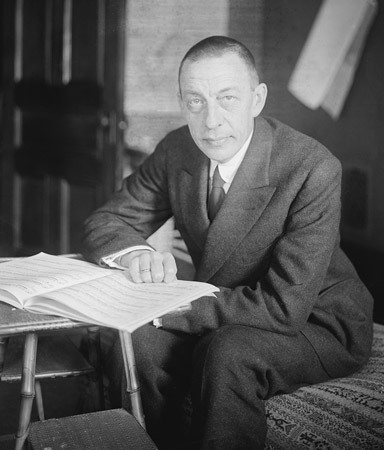 Early in his career, Rachmaninoff went through a long period of “composer’s block.” After the disastrous premiere of his Symphony no. 1, Rachmaninoff suffered a serious nervous breakdown, lost his inspiration, and couldn’t compose another note. Only after he visited a hypnotist could he get past his block. After his recovery, Rachmaninoff’s next creation was the Second Piano Concerto — by far his most popular piece. He dedicated the piece to his hypnotist. Sergei was a phenomenal pianist, and he wrote many of his famous compositions (such as that piano concerto) for himself to play for a particular occasion. Today, he’s best known for those piano pieces — and for his nicknames.